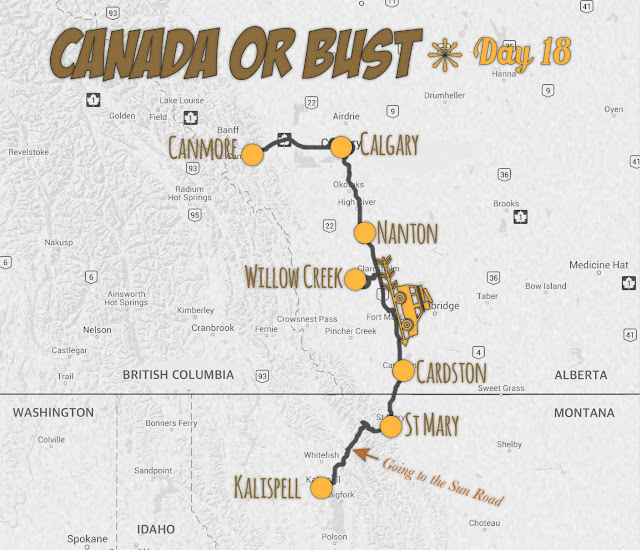 Day 18: Canmore, AB to Kalispell, MT. A little cranky about casting off from our cozy, comfy Canadian condo, we cached our cargo in the car and prepared to bid bye-bye to our northerly neighbor. Google Maps advocated a route on BC-93 through British Columbia to reach Kalispell—just west of Montana's Glacier National Park—but our car GPS routed us southeast through Calgary. Even though we've been hearing reports of Calgary's struggle with smoke from the Washington state forest fires, we decided to go that way to allow us to drive through Glacier on the way to our hotel in Kalispell. 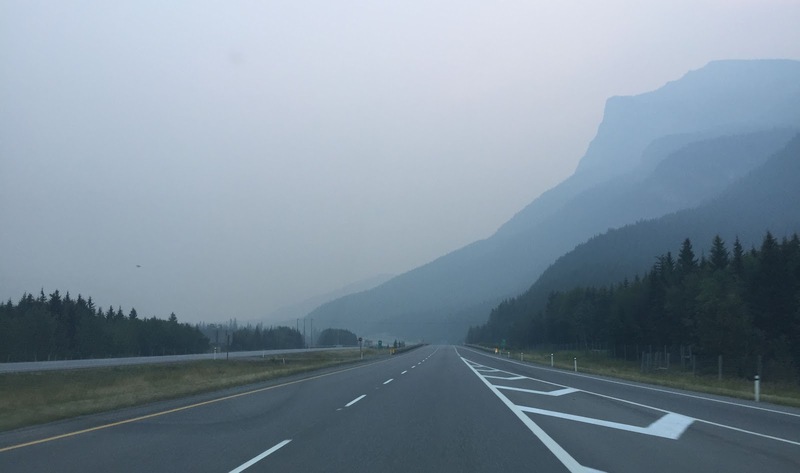 When we left Canmore at 8 a.m., the temperature was hovering around 40 and the skies were still extremely hazy from BC and Washington smoke. Even though we were surrounded by majestic megalithic mountains, they were covered in clouds of smoke—a pattern that would continue. Within an hour, though we were only 40 miles from Canmore, we were out of the Rockies—as near as we could tell, for the smoke was ever present. Land adjacent to the highway was more agricultural with herds of cattle grazing and fields dotted with round bales of hay. 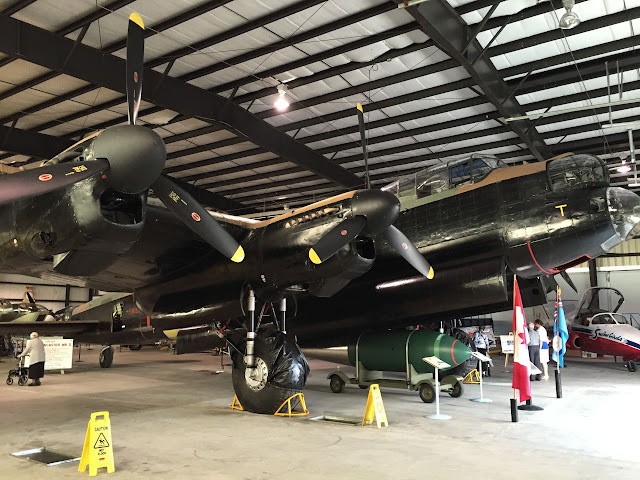 The letterbox stamp was an image of the Avro Lancaster. Half an hour south of Nanton, a noxious stench began to invade our car, even though our AC was set to recirculate air already in the passenger compartment. We were driving through southern Alberta's notorious "feedlot alley" with the highest concentration of intensive livestock operations in all of Canada. In the past, the area has been the target of national attention due to its toxic water quality blamed on the huge amounts of manure produced each year by the millions of cattle, hogs, and chickens raised there. Even horses are not immune to slaughter in feedlot alley, where they are fattened and slaughtered in immense facilities that export million of pounds of horse meat to the European Union annually. Before entering Fort Macleod, where a massive horse slaughter house is located, we were thankfully diverted onto Highway 785 to Willow Creek to visit Head-Smashed-In Buffalo Jump World Heritage Site—certainly a detour filled with irony after driving through feedlot alley. 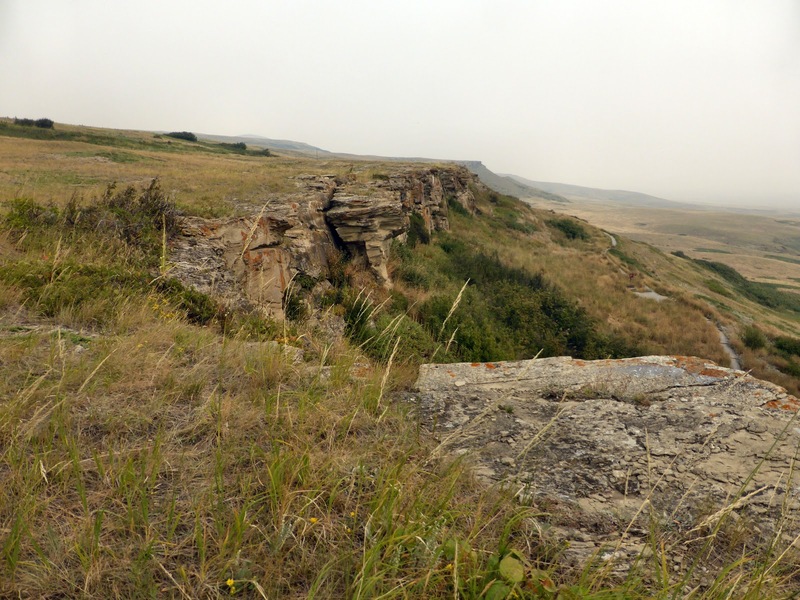 Where the foothills of the Rocky Mountains begin to rise up from the vast Alberta prairies, opportune cliffs were used by indigenous people in buffalo hunting. Before horses were introduced to North America by Europeans, the Blackfoot people created "drive lanes" near these cliffs, using hundreds of stone cairns. Hunters chased bison from their prairie grazing ground, funneling them into the drive lane. As the herd unknowingly neared the precipice at the end of the lane, young men, known as "buffalo runners" and dressed as wolves and coyotes, triggered a stampede, sending the bison into a 60-ft freefall over the edge at full gallop. The cliff is currently only 30 feet tall, but has been estimated to be 60 ft at the time of buffalo jumps here. A common practice among Plains natives, this was but one place in the area used as a buffalo jump. Its name derives from a Blackfoot legend about a young boy who, wanting to get a close look at the jump event, hid below the cliff. Inevitably, his skull was crushed by the weight of the buffaloes falling on him. When his body was found, the tribe began referring to him as the Blackfoot language equivalent of "Head Smashed In." 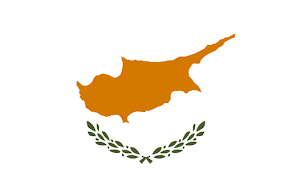 The location was designated a UNESCO World Heritage Site in 1981 due to the archaeological evidence of human activity in the area for at least 11,000 years. 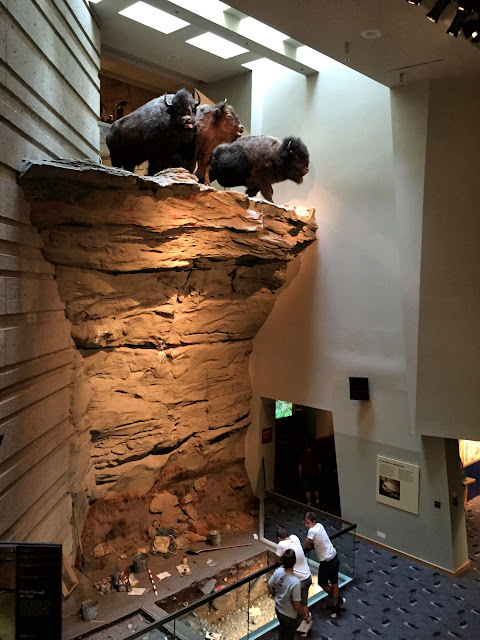 A 39-ft deep deposit of bison bones found at the site indicated that this buffalo jump was in use for nearly 6,000 years. The cliff was once sheer like this model in the museum. 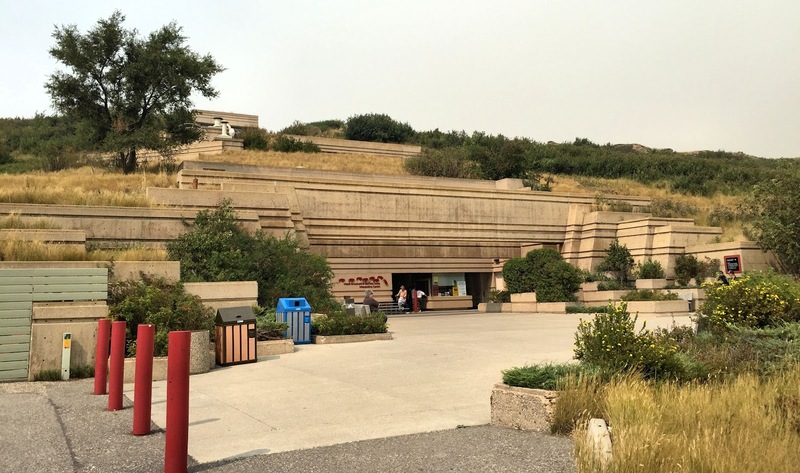 An innovative multi-story interpretive center built into the side of the cliff relates the history of this hunting custom and other aspects of Blackfoot life. 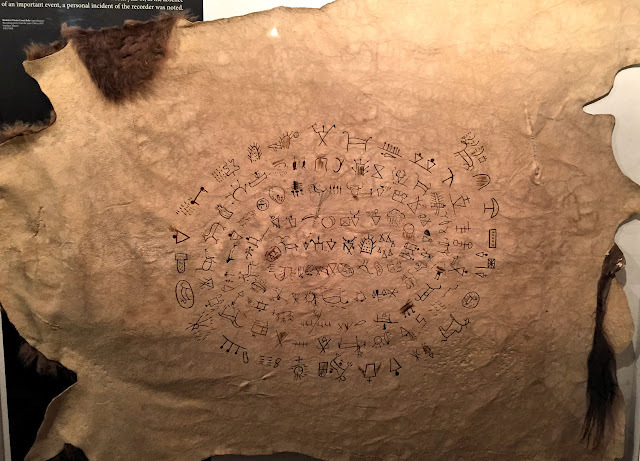 One of the most remarkable exhibits was a large buffalo hide called a "winter count robe." Blackfoot people employed pictorial symbols painted on a hide as a means of keeping records over time with one important event recorded for each year. The winter count on exhibit covered the time period from 1764 to 1879 and recorded such incidents as a smallpox scare, the building of a buffalo corral, the arrival of Europeans and bears coming into their camp. After Head-Smashed-In, we returned east on 785 to Highway 2 so that we could enter the U.S. on Glacier's east side. 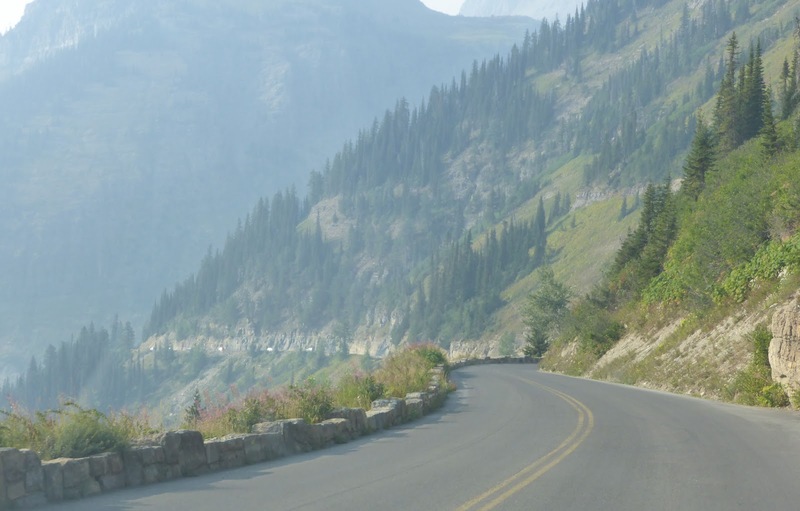 This would give us the opportunity to drive the legendary Going to the Sun Road today on our way to Kalispell, near the west entrance. The combine waltz, orchestrated by GPS programmed in each machine. Just south of Cardston (pop. 3,580), the southernmost Canadian town on Highway 2, we passed an alfalfa field where five hulking combines in orchestrated synchronization were making quick work of harvesting the crop. Unable to resist getting a closer look at this impressive bit of coordination, we pulled into the gate and just inside the field, where we gawked and photographed the reaping and threshing until we suddenly realized we were blocking the path of an approaching grain truck. After we moved to permit the truck's entry, we enjoyed a conversation with truck driver Jakob. He was waiting for the previous truck to fill and take off for the grain elevator before he needed to pull into place. 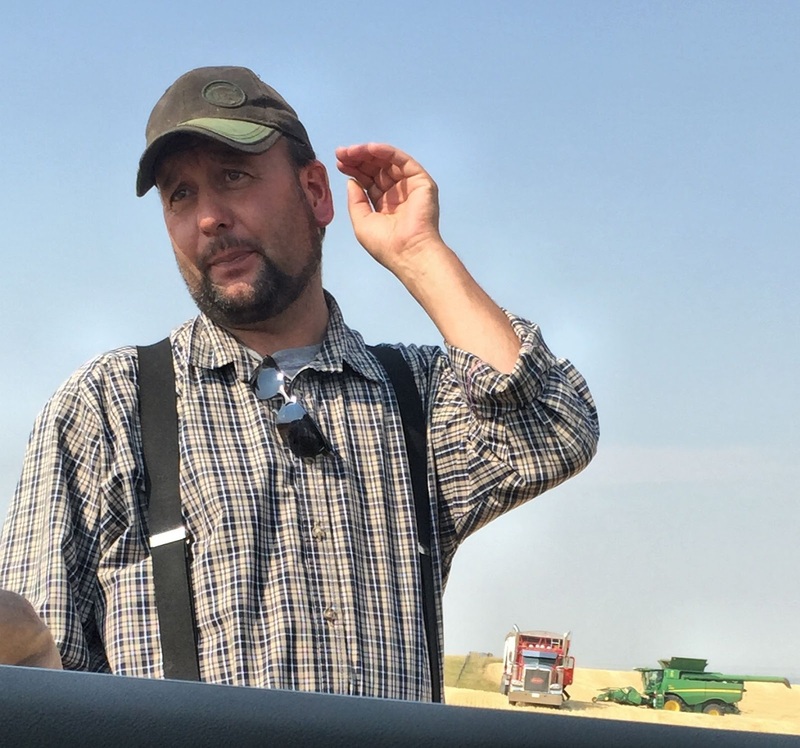 Jakob and others working the field are members of the East Cardston Colony of Hutterites, a communal religious group that migrated to the U.S. and Canadian prairies from Ukraine in the late 1800s. The group shares some common ancestry—and common beliefs—with Mennonites and Amish, including modesty in appearance and an agrarian lifestyle. Hutterites believe in a community of goods, in which all material goods are held in common by all members of the colony. Several colonies reside in Cardston County and, in common, hold substantial stretches of farm land. Continuing south, we shortly crossed into the U.S. with a minimum of fuss at border control and drove on toward Glacier National Park. About 4:30, we entered the park at St. Mary on the Going to the Sun Road. Often hailed as an engineering marvel, the 53-mile road was completed in 1932 and traverses the entire park from east to west, crossing the Continental Divide at Logan Pass (6,646 ft). Like the entire northwest area along the U.S.-Canada border, the air in the park was thick with a smoky haze. We were able to see only vague outlines of what are no doubt spectacular mountains. The ranger at the entrance gate assured us that the entire road was open through the park but warned us about a stretch near the Reynolds Creek fire site (marked on the map he provided) where stopping is currently prohibited. 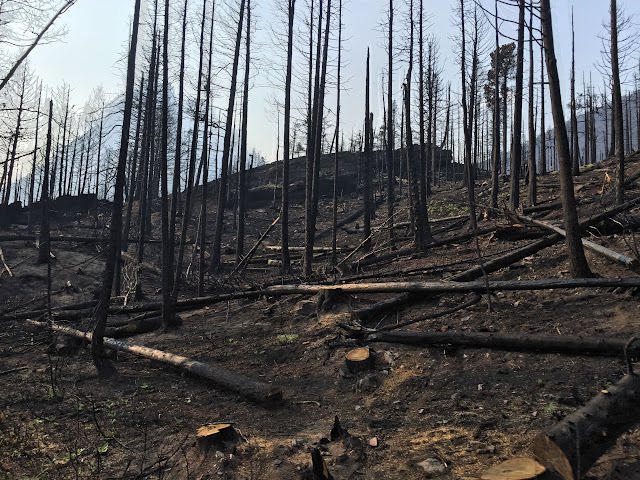 Driving through that section—one of three active fire areas—we saw numerous stretches where skeletal remains of trees testified to the inferno they had experienced. 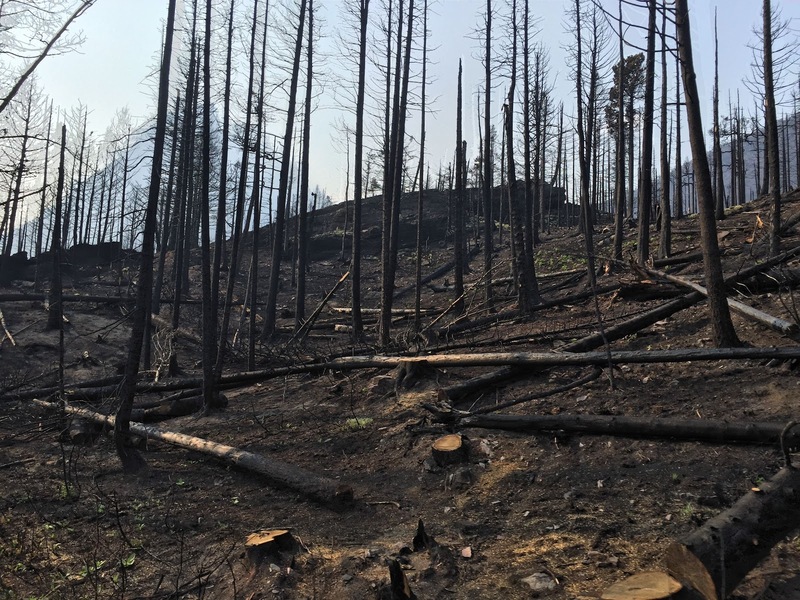 But fire is a critical element in the natural progression of forests, we were told, and, as such, a "necessary evil." Fire has been at work in Glacier National Park. Eighteen miles from the entrance we reached the Logan Pass visitor center, where the visibility was briefly and slightly improved—meaning we could see mountains across the road. 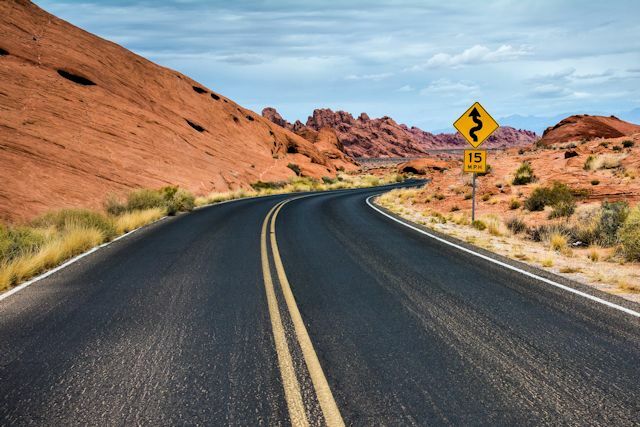 Past that landmark and the nearby Continental Divide, we entered the section of the road that has won engineering awards. Considering the technological and engineering tools that were available in the 1930s, engineers and construction crews accomplished the near impossible as they dealt with sheer cliffs, short construction seasons, sixty foot snow-drifts, and tons of solid rock. 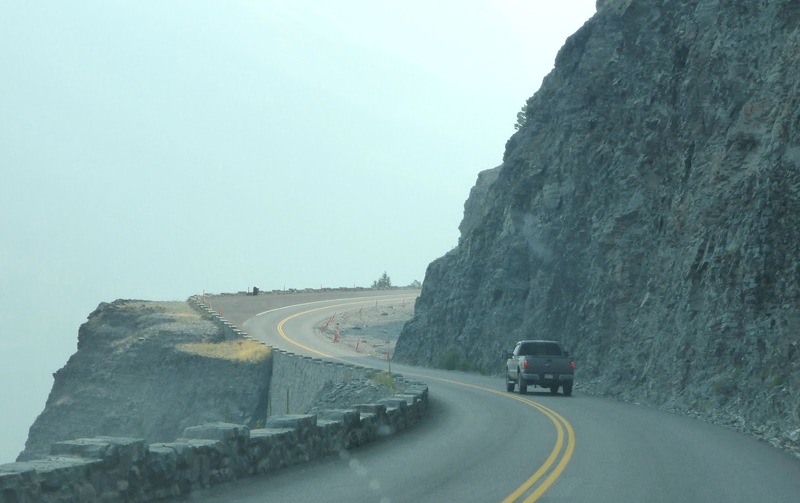 Guardrails along the Going to the Sun Road cannot be sustained due to frequent avalanches and rock slides. Having missed much of the vistas that made friends and family rave about the scenery on this unique road, we reached the west entrance to the park and drove south to Kalispell, where we will spend the next two nights. Tomorrow we'll explore the area around the western entrance, hoping for clearer skies.